Heckscher playground (renovated) and ball fields (new), lower left. The new Zoo and renovated Arsenal, opposite the Heckscher Ball Fields on the right. Tavern on the Green, just north of the Heckscher Ball Fields on the left. The Great Lawn, just below the Reservoir. North Meadow, the light area just above the Reservoir. The Conservatory Garden, just above the Reservoir on the right. Harlem Meer, in the upper right corner (completed in 937). Thousands of recently planted trees, numerous new paths, etc. Rosenzweig, Roy, and Elizabeth Blackmar, The Park and the People: A History of Central Park, Cornell University Press (1992), pp.448-451. Reviewing Moses' first year in office, the New York Times Magazine declared that "Central Park also has a new deal." It pointed to "the brand-new brick-and-concrete zoo" that replaced the "hideous old wooden sheds," the "swank restaurant and cafe [Tavern on the Green] now housed in the shined-up sheepfold buildings," "the garden plaza enclosed by the new zoo," "the refurbished State Arsenal," the extensive "plowing, seeding, planting, and replanting," and the new athletic fields on the North Meadow that gave the "grass effect of a big-college football field or the polo field of a country club." In the next seven years, he would oversee a 50 percent growth in city park land (from 14,500 to 22,500 acres), a tripling of playgrounds (from 119 to 424), and a thirtyfold increase in swimming facilities. By the following summer, he was supervising twenty-six hundred Works Progress Administration workers in a $2 million renovation of Central Park. Not since the park was first constructed had so many worked there, and not since that earlier era had it undergone so many changes in such a short period, decisively shaping the park New Yorkers use today. By the time Moses was finished, he had substantially enlarged the recreational facilities to provide "leisure de luxe," as a newspaper headline put it. 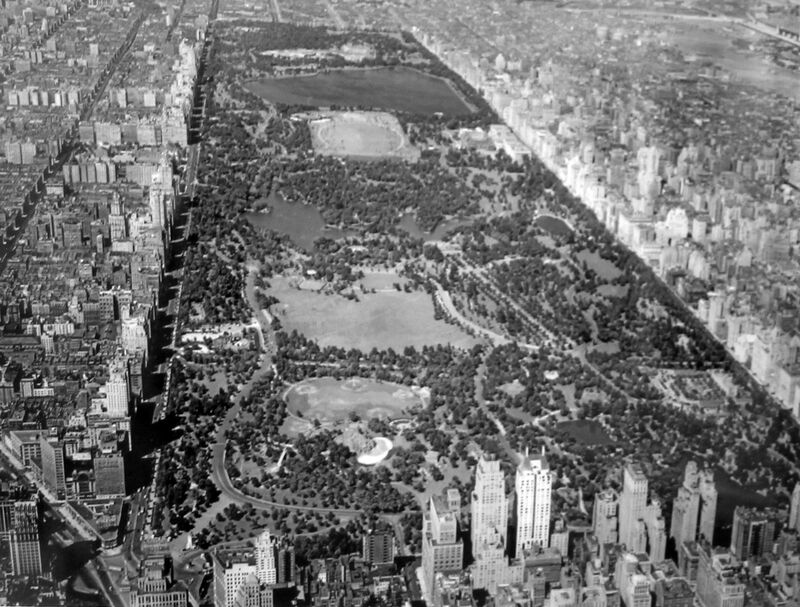 In 1934, after seventy-five years, Central Park still had only a single playground, the Heckscher Playground in the southwest part of the park. In just three more years, it had twenty-two, including seventeen (twenty by 1941) "marginal playgrounds" dotted along the park's outer rim -- each equipped with slides, swings, jungle gyms, playhouses, and sandboxes and circled by benches for mothers and nurses. ... With the new marginal playgrounds limited to small children, the playground in the northeast corner of the Great Lawn was reserved for older children, and the Great Hill was set aside for adults. In the 1920s, it seems, the restriction limiting the ball fields to those under sixteen had been dropped; now, access was expanded further as Moses added new fields. The real reason Moses was able to do so much was federal money. New York was receiving more than its share of the newly flowing federal dollars, in part because La Guardia enjoyed good relations with Franklin Roosevelt's New Deal administration -- good enough to smooth over the problems caused by the president's hatred for Moses, which went back to old fights in New York State. Also see pp.333-335 for a graphic and gruesome description of Central Park as it was in 1932 when Moses became Parks Commissioner. The Report of the Department of Parks to August 1934: Memorandum on 1935 Budget Request of the Department of Parks, NYC Department of Parks archive. New York City Parks Department photo archive, negative number 14257.